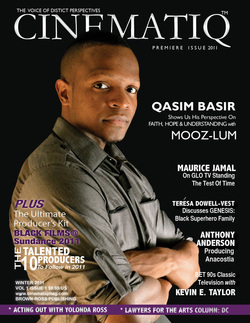 In celebration of Black History Month,enjoy the first ever Issue of CINEMATIQ™ Magazine! BROWN-ROSS Publishing first published this issue in 2011. The idea was to publish a quarterly resource magazine with a distinct perspective on Black cinema. We wanted to promote, honor, re-educate and celebrate the Black experience in our own words in doing so, we provide a platform for the emerging and established filmmaker taking strides to entertain and educate us all. It has been a long journey but we are still here, we are still standing! After the second issue, we decided to go on hiatus and redevelop the magazine. We did a good thing because the magazine has evolved into a stronger brand. We are on our way to becoming the nations go to publication on the art, culture and business of cinematic portrayals dominated by images of the African Diaspora. Read and download the full issue FREE or purchase a print and own a piece of history. Stand by for the long-awaited 2015 issue set to launch the 2nd quarter. It will be available in print and now digital! Find us on our new instagram and joint the mail list for updates! CINEMATIQ™ MAGAZINE RETURNS WITH NEW LOOK & MAGAZINE 2015! Join the mailing list for exclusive inside look!